For the next few months, I'll be focusing on summer learning and all the great activities you can do to keep your kids from experiencing the dreaded "Summer Brain Drain" where students forget and lose the equivalent of one to three months of learning. So I was more than happy to accept the offer to be a Little Passports ambassador (this is an affiliate link). I had actually already just subscribed to their USA edition, where we get activities and information on two different states each month, and I plan to continue it. As an ambassador, I get a subscription to their World Edition and updates that I am allowed to share with all of you. I'll just be writing about our experiences once a month so you can see how the program works and decide on your own if it will work for your family. Signing up for the program is super easy: All you have to do is go to their website and select which edition you want (World Edition or USA Edition), then choose your subscription plan according to your budget. You have the option of a monthly, 3-month, 6-month, or 12-month plan. On their site you can find a complete description of each package, including what materials your child will receive and which countries/states will be covered. You can even find samples of the montly adventures you'll receive. We received our first World Edition last week. 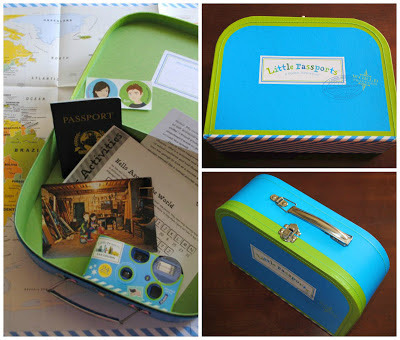 It came with a suitcase filled with goodies, including a world map, passport, activity sheet, stickers, boarding pass (with directions for going online and accessing the Little Passports interactive pages with additional learning resources), a disposable camera, and an introductory letter from Sofia and Sam, your young tour guides on your adventure around the world. My kids loved having a child-sized suitcase they can keep all of their materials in and a passport to travel the world. The activity sheet was super fun requiring my kids to decode some numbers to learn how to say hello in different languages. At the bottom of the sheet, they had to use the map to locate the capitals of different countries in order to find the answer to another question. On the back they get to practice their math skills by counting flags to answer a different question. 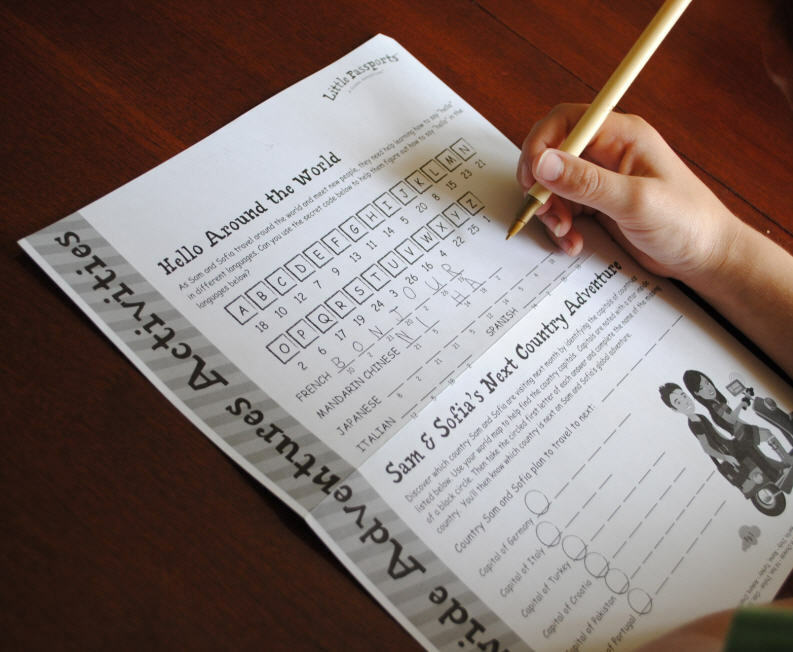 I really love how this program gives my kids a chance to practice their reading, geography, and even math skills with the very first package. And it's fun for them! They loved looking through all of the materials, especially their little passport. In a few weeks, I'll share more of our experience with the program. And if you're already sold, you can go and sign up via my affiliate link here. Disclosure: I am a Little Passports affiliate. All the links used in this post are affiliate links. Me encantó! Pero todavía no envían a México, estaré al pendiente.